Nicholas Noonan gets assistance from Brayden Cook to put a stop to the Eagles drive. 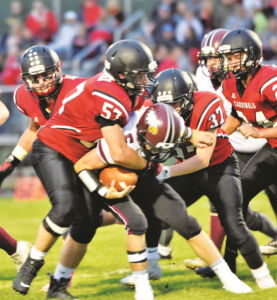 It was a breezy 61 degrees last Friday for a conference matchup between the Jefferson Eagles and the Brodhead-Juda Cardinals. The Cardinals recent offensive struggles seemed to carry into last Friday night, as the Cards only managed 142 yards of total offense against the Jefferson defense.